For something as simple as collecting shoes, the ever-expanding community of sneakerheads likes to take itself pretty seriously. If you couldn’t rattle off the exact origin story or state how many points Michael Jordan wore when he first debuted a certain model, older, more experienced fans might send a death glare your way. If you just discovered a vintage model for the first time, you could expect a lecture from those who discovered them ten years earlier. From the outside looking in, one could argue that sneakerheads derive superiority in something most would describe as fairly trivial. 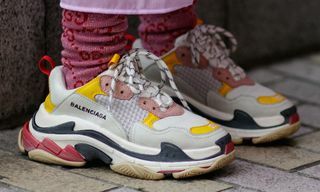 As sneaker collecting reaches the mainstream though, a distinctly un-serious trend has bubbled up. 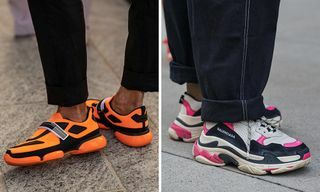 While Nike and Jordan make beloved silhouettes more accessible to new customers, and adidas revives its catalog of trainers to newfound success, chunky — and at times downright ugly — footwear has also found its footing. The seemingly orthopedic has suddenly become fashionable. For a few years, it seemed as though the trainers of the ‘90s were lost to the past. A proverbial mistake that we wouldn’t bear repeating. At one point, skateboard shoes from the likes of Osiris and Airwalk were massive, cross trainers like adidas’ lesser known EQT models were bulbous and Nike’s various styles like the Air Tech Challenge and Air Footscape were bloated. Basketball sneakers like the Nike Air More Uptempo and the early Kobe models from adidas were better suited as boats than shoes. Those once-beloved models are now finding new life in the new millennium. While simpler styles like Sambas — and eventually Common Projects — came to define the ‘00s, by 2011, creations from Camper and Bernhard Wilhelm had started ushering in a new era of ugly, their zig-zag soles and rope laces mimicking the Isabel Marant sneaker wedges that exploded in popularity around 2012. 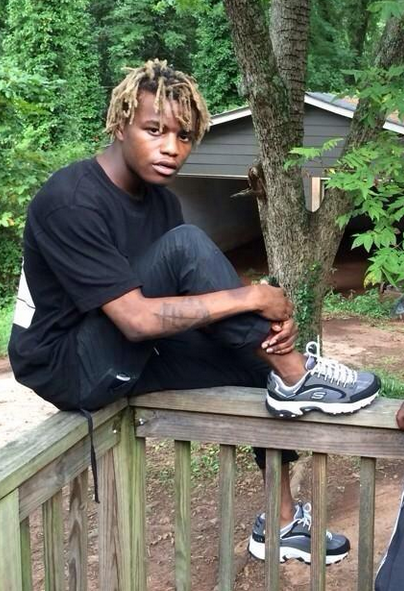 Ian Connor championing Skechers footwear was also a moment to reflect back on. Ugly footwear had started its path toward being unironic. Which brings us to today, a new golden era for oversized, ostentatious footwear. 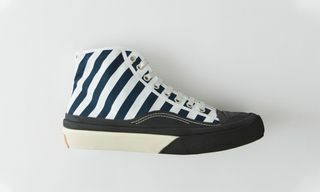 One where panel overlays, mixed materials, huge soles, and even more blown-out shapes have become commonplace. 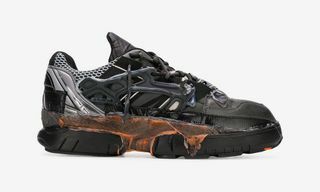 As we transition out of a time when many were convinced that elevated, $300+ basic sneakers were worth the investment, we now have borderline works of art, many of which are different from the models that came before them. Take a look at your favorite high-end store’s shoe department right now. Odds are that among the selection you’ll see any number of outrageously absurd styles. 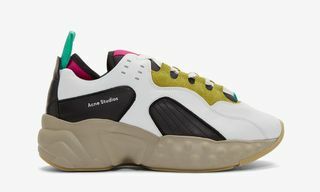 Take your pick: Raf Simons Ozweegos, Maison Margiela Futures or Mixed Media Trainers, Balenciaga Triple-S, and soon Gucci’s Cruise SS18 sneakers, as well as the latest from Acne Studios. Even the newest Yeezy “Wave” Runner from Kanye West strongly resembles the éS Scheme sneaker from 2011. So while the immediate reaction of the uninitiated tends to be of disgust, they typically warm to them after a while, noting the intricacies of how the panels are stitched together or the design elements not usually found on more widely available models. It’s a prototypical fashion brainwash, tempting us to the point that we have to admit that the ugly has somehow become attractive. Call it adept design or, more accurately, smart marketing, consumers seem to be warming to the look. But more than anything, sneakerheads are taking it all in stride — opening themselves up to previously unexplored avenues. That alone is a feat worth recognizing. They may not have the backstory of an Air Jordan I that has been around for three decades or a runner that hasn’t been retroed for two decades, but then again, they’re just shoes anyway. Stay updated by following @Highsnobietysneakers on Instagram. Skylar Bergl is a freelance writer based in New York City.